For many Minneapolis homeowners, adding an outdoor living area to their yards this summer is at the top of the to-do list. Creating an outdoor room can provide you with lots of opportunities to enjoy your yard more. With the right planning, you can incorporate those areas that you’re going to use the most. Here are the steps to take to design the best possible outdoor room in your yard. Many people look at their yards and know they want to add an outdoor living area, but what is this room going to be used for? Is it going to be an outdoor kitchen, a gathering place, a spot for outside dining and entertaining, a quiet place to spend some alone time, or an outdoor activity center complete with theater? There are many options, and knowing which it is going to be can help with the planning. Whether or not you choose to use or put up walls or dividing spaces, you should be able to have a vision of the room and how you want it to look. You can then feel more confident about what you’re going to have in that space. As we talk with our clients in the planning stage, we’re really interested in knowing what they have in mind and what their visions are. Many times homeowners have a vision, but they throw that vision together without creating a plan. This plan is what is going to keep you on track and make your dreams come true for the outside areas of the home. The plan should cover your needs, wants and what you don’t want for the outside room. The layout should also be covered. That’s where a landscape design architect can be helpful. We can help with this part of the process and make your vision become a reality. When you create a timeline, you need to stick to it. The same is true for the budget that you have to work with. When you stick with both, you’re more likely to get the job done and not go overboard with the amount of money that you spend on the project. If you’re tackling this project yourself, before starting the work, you have to make sure you know more about the space you’re going to be using, as well as any codes you have to follow. Knowing more about the process is going to allow you to feel good about the choice that you have to move forward with the building process, while doing everything up to standards. Obtaining any necessary permits is part of our process, and we make it a priority to communicate with our clients at every stage so they know what to expect. Now that you’ve decided to put in an outdoor room, check out our earlier post to learn how to make your outdoor space more functional. 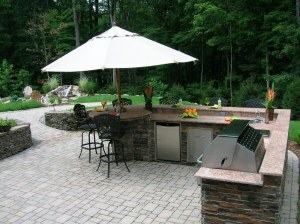 We can help you from start to finish here at Architectural Landscape Design. Allow us to create that outdoor room in your Minnesota backyard. We’ve helped with many before, and we can make sure yours becomes a reality, too! Why not contact us today for a free initial design consultation?